More Dogs Ride In A Ruff Land™ Than Any Other Performance Kennel! Built tough, like a performance cooler! 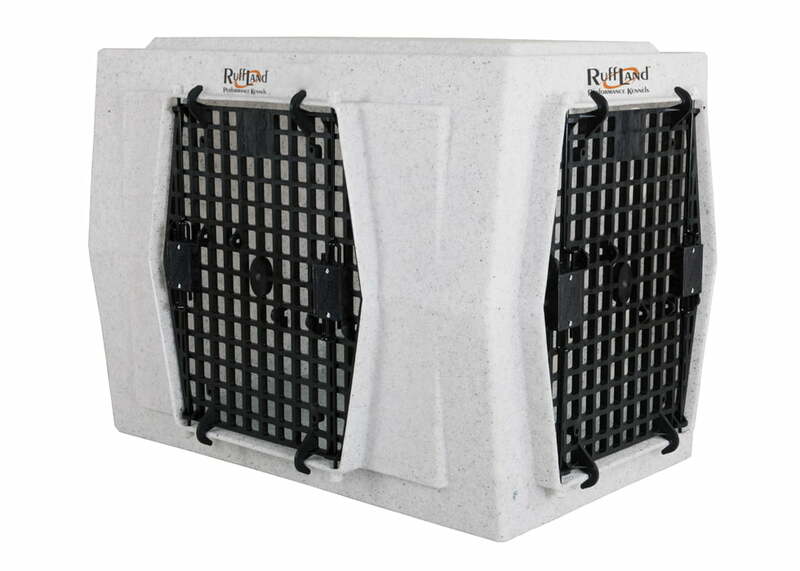 Ruff Land™ kennels feature one-piece roto-molded construction from UV-stabilized polyethylene. This means no assembly and no bolt-through ledge (as on two-piece kennels) which saves up to 3 inches of side space. It also makes for a much stronger kennel. And, because there are no seams, it is also much easier to clean. 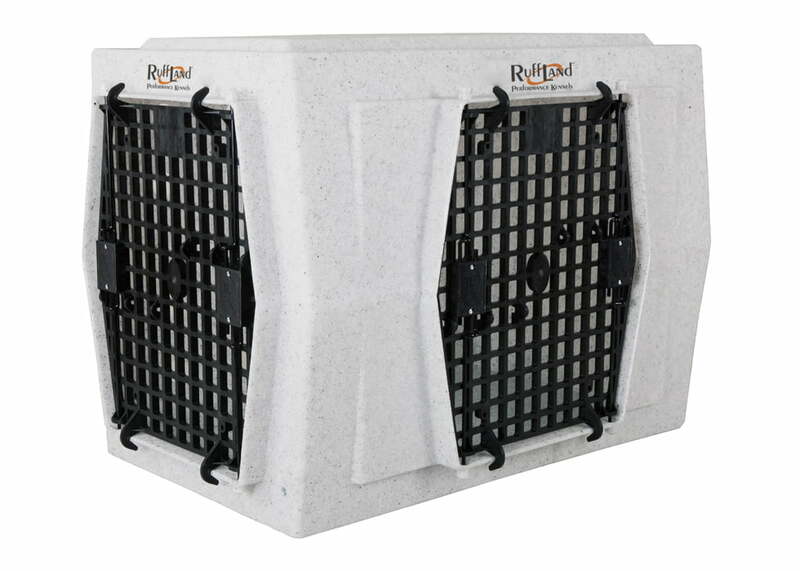 Finally, a Ruff Land kennel won’t crack even in extreme subzero weather. One-piece design means no assembly, much more strength. 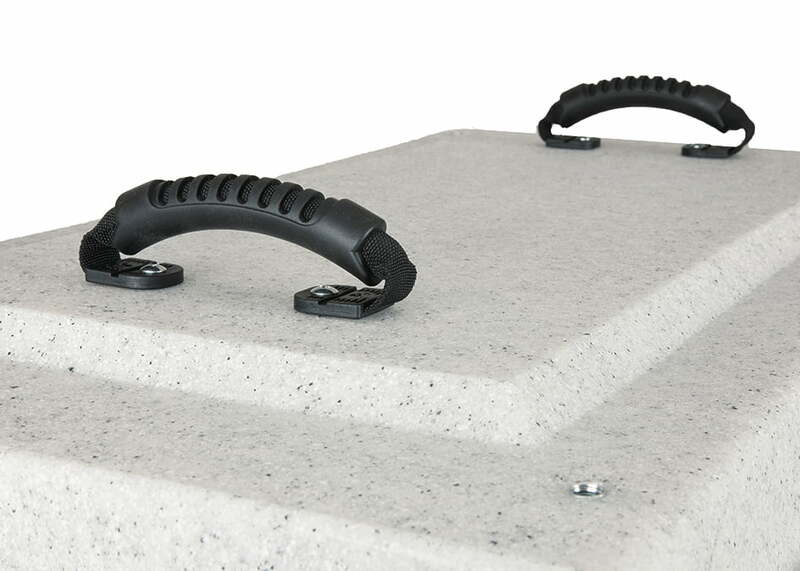 No bolt-through ledge saves up to 3 inches of side space. No seams (and removable doors) for easier cleaning. Built safe, like a performance race car! It’s an unfortunate fact that too many dogs are injured or killed every year in vehicle accidents. 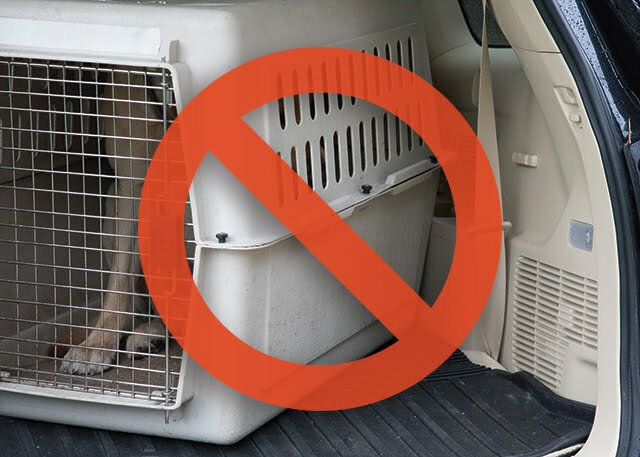 The truth is, traditional dog kennels are simply not designed to protect their four-legged passengers. 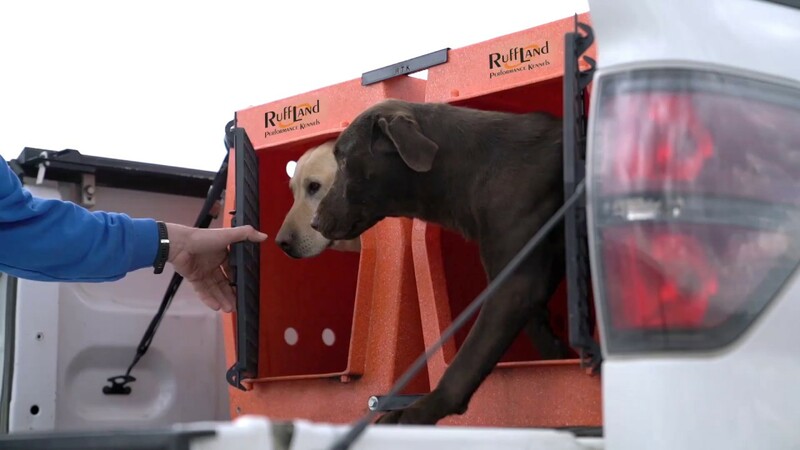 Ruff Land kennels feature race car-inspired Ruff-Flex™ Energy Dissipation Technology, a series of design elements that dramatically improve the odds of your dog surviving an accident. 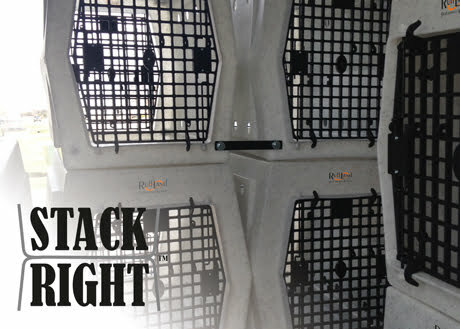 Most kennels are simply not strong enough to protect your dog in an impact situation. Ruff Land’s one-piece roto-molded construction is extremely strong. The walls, top and floor on Ruff Land Kennels also have built-in flexibility which absorbs energy that would otherwise be transferred to your dog. This is where the “stiff”, two-walled plastic kennels, which claim to be safer, fail. They may not break, but when your dog hits the side of the kennel, there is no give like there is with a Ruff Land. 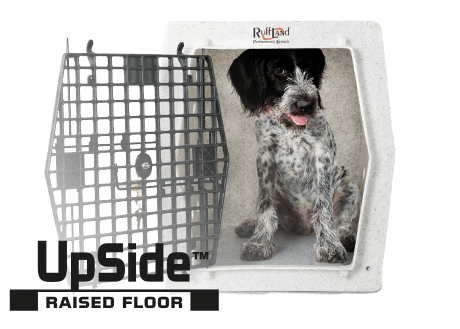 The raised floor in a Ruff Land also serves to provide both strength and cushion as does the designed-in body crease around the middle of the kennel. Likewise, the composite doors on a Ruff Land kennel are remarkably strong and designed to absorb energy. Plus, they feature six locking lugs where other kennels have no more than four. Then there are the all-important heavy-duty tie-downs which you should always use. 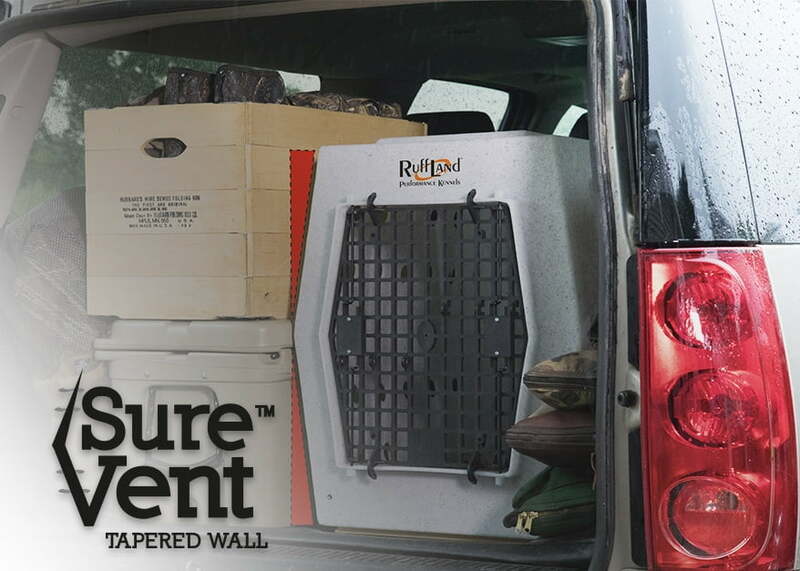 If your kennel is connected to your truck it can take advantage of your truck absorbing impact energy. But only if the tie downs are designed properly. Ruff Land tie downs are designed like the driver retention devices on a race car. 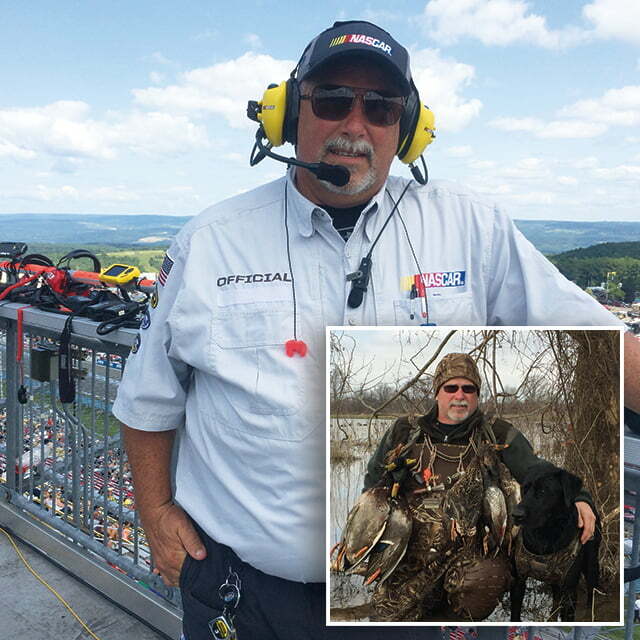 There is nothing more important to NASCAR than driver safety. A key attribute to all safety efforts is building flexibility into the race car to absorb and dissipate energy. Ruff Land employs these same proven energy absorbing principles into their kennels, unlike other kennel brands that claim safety. If you want a kennel that is built for safety, buy a Ruff Land. 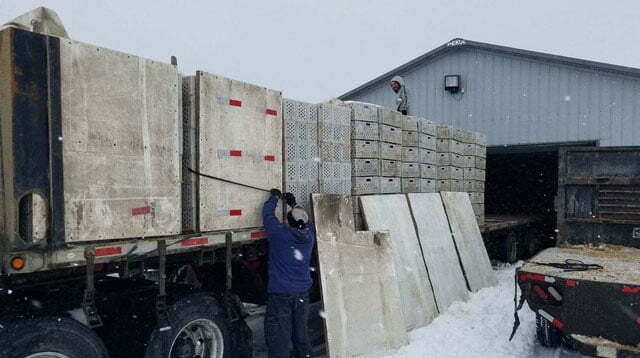 Here at MacFarlane Pheasants, we have used a variety of crates over the years to get our product all across the country. Our homemade wood crates were our “go-to” but continued to test new style crates as they came on the market. 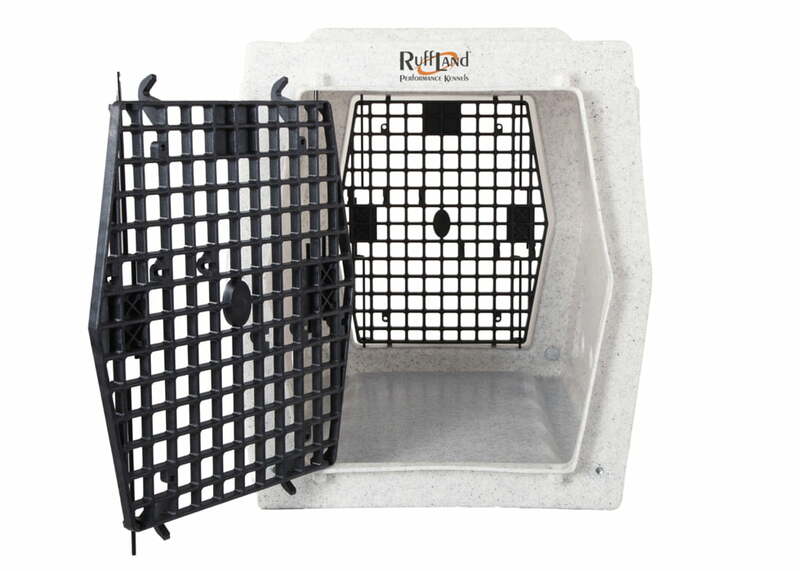 RuffLand Kennels now makes 3 sizes of crates that we have tested and have in our inventory. 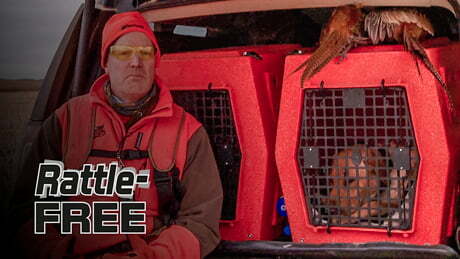 We use the short 7” for our Partridge, placing 15 Huns or Chukars in at a time. The 9” model we use for hens, roosters or partridge. When temperatures are less than 70 degrees we will place 10 RN hens or 5 RN roosters or 15 partridge in them. 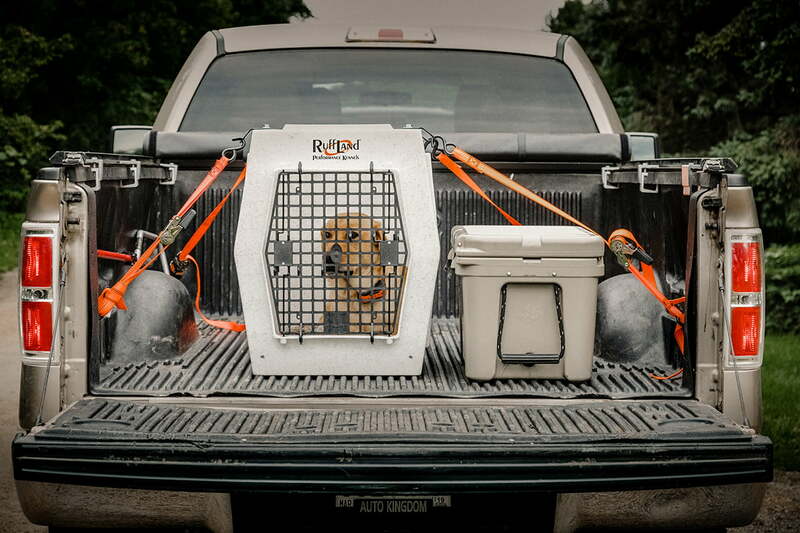 We like the versatility of this crate. 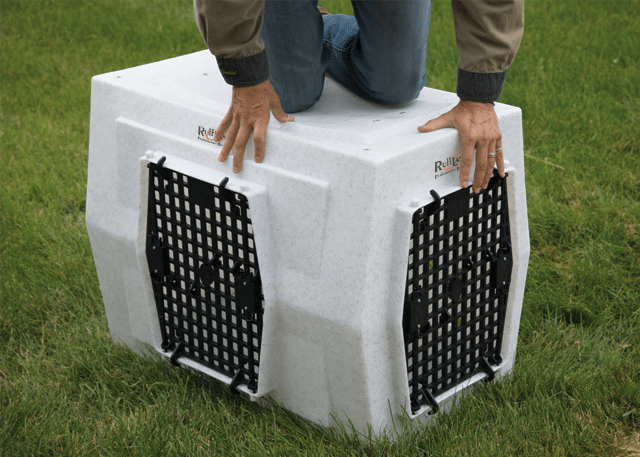 The large double-door “big” crate is twice the dimensions of the small 9-inch crate. This crate is used only for roosters. The advantage of this crate is the tail quality stays high once the birds are placed inside and travel across the country. 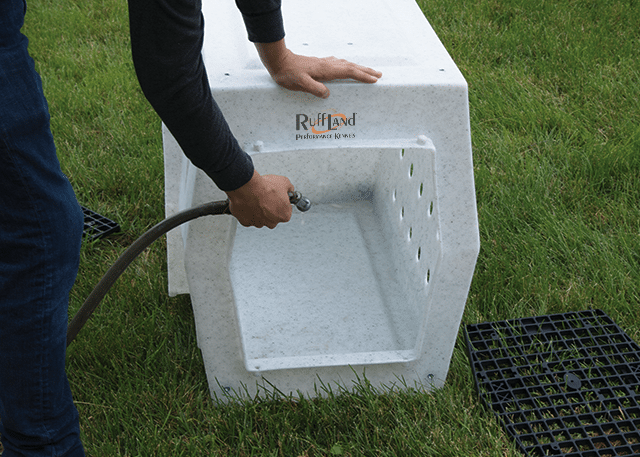 All these crates have great ventilation, the color white does not attract heat, and having hand-holes makes these easy to handle. The light-weight feature compared to our old wood crates is a huge benefit and having the ability to wash the plastic crates is important in our bio-security plan. 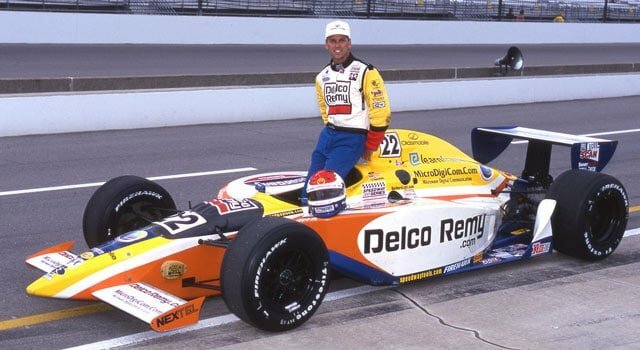 The Unser family has been involved in racing for 4 generations and our success depends on quality, durability, and performance. Through my volunteer involvement with Search and Rescue as a K-9 handler I depend on the very best equipment for my dogs, that’s why I use RoughLand Kennels. “On August 14, 2016, while returning home from a dog agility competition, I was involved in a vehicle roll-over accident. My dog, a 43 lb. Australian Shepherd, was in a Ruff Land Intermediate size kennel. 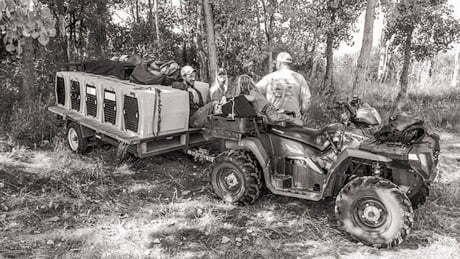 The kennel was attached to a plywood frame I had installed in the vehicle, which was anchored to the vehicle body. I had used the Ruff Land tie down kit and bolted the kennel to the plywood. 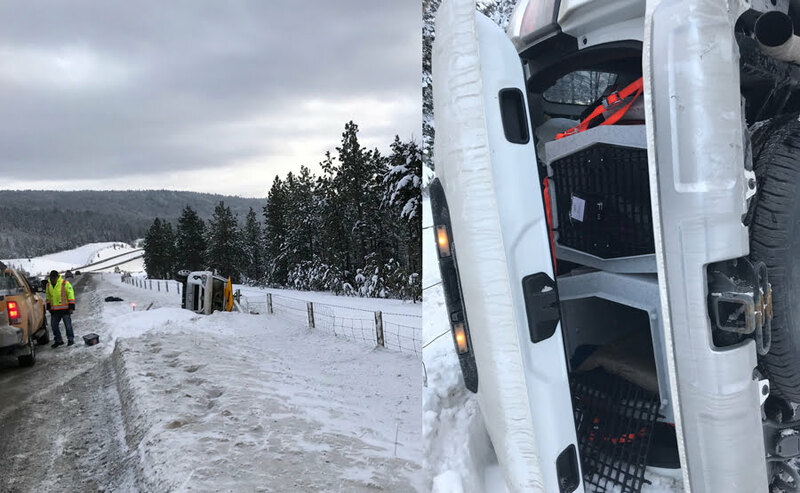 Both the dog and I were helped out of the vehicle with basically no injuries. I took the dog to the vet for a checkup and the only comment the vet had was, ‘He’s a little sore in the lower back’. Obviously, he was tossed around in the kennel during the incident. All the side airbags deployed, but the fact that he could walk away from the accident is testimony to the kennel behaving exactly as advertised. 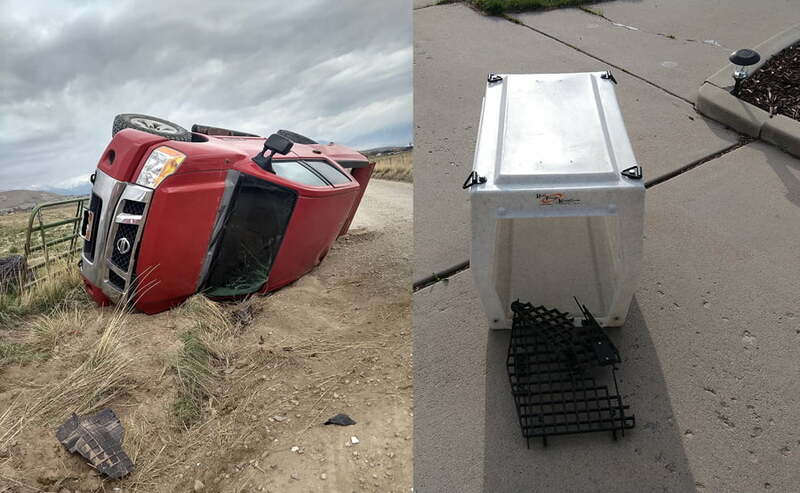 When I retrieved the kennel from the wrecked vehicle the only mark I found was a blood smear from me as I was extracted from the back of the vehicle. This past Friday (4/23/18) I was participating in a NAVHDA NA test with my Pudelpointer named Murphy. We had completed the fieldwork and tracking part of the test and were traveling to a nearby river to do the water part of the test. On the way there, I was t-boned by a car going extremely fast. It flipped my truck and we went airborne. No one was injured thankfully. My pup was in his kennel in the bed of the truck. I had put an insulated kennel cover on it which had rings for the tie-down straps. I had four straps ratcheted tight on the kennel cover in their rings. Unfortunately, those rings failed. My kennel did not. Murphy was thrown from the truck approximately 50 feet and landed in a nearby field still in his kennel. The only damage to the kennel was the door!! The rest was completely intact. Murphy was shaken up but completely uninjured. He was given a clean bill of health by our vet and finished his testing. He got a perfect score of 112 Prize 1. Thanks for such an amazing product. I am so glad I took the advice of my breeder and bought this kennel when I bought the pup. We have 2 of your kennel crates and they are the best we ever had by far! 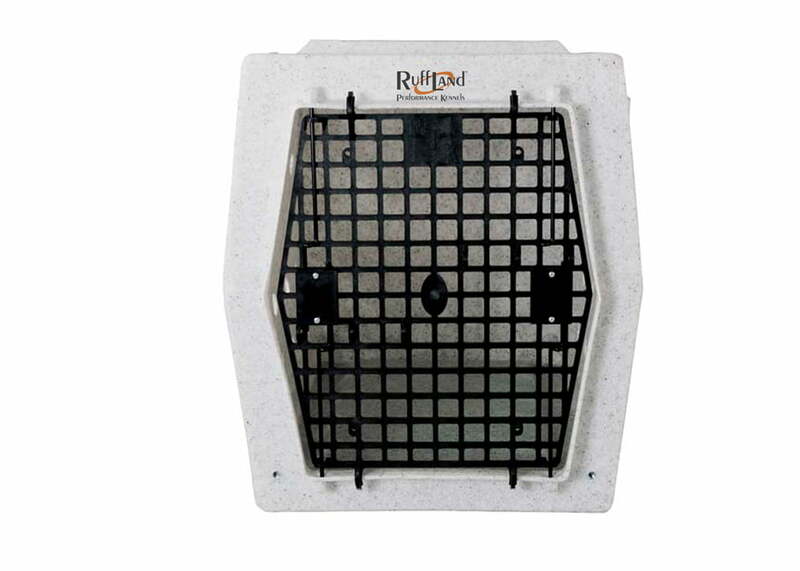 The sidewalls on all Ruff Land kennels feature a series of vent holes. These vent holes ensure proper air circulation for your dog. Ruff Land took this one step further by tapering the side walls so that the vent holes will never get plugged, even if you slide the kennel up against a wall or some other flat sided object. The interior floor in a Ruff Land kennel is raised so that debris and liquids that fall or spill off to the side are channeled away from your dog. 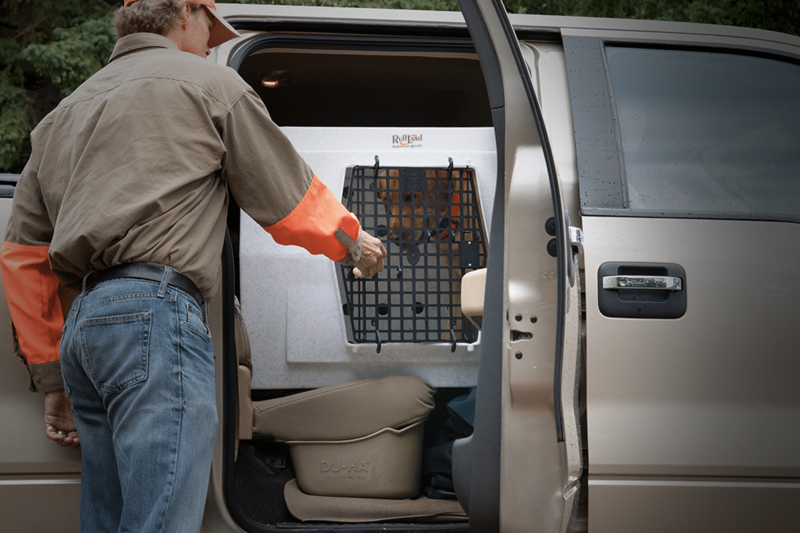 This UpSide™ raised floor design also creates some flex for a built-in cushioning effect for your dog as it rides in your truck. The tops and bottoms of Ruff Land kennels all feature form-fit nesting that allows the kennels to fit together, making them stackable. 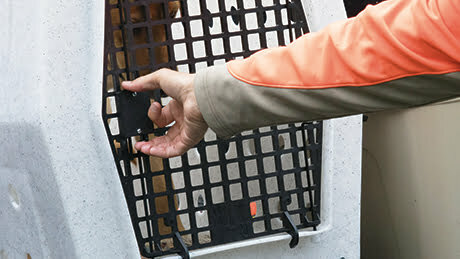 Ruff Land kennels are pre-fitted with threaded inserts to accommodate custom handles (optional). Take advantage of your truck’s absorbing impact energy with Ruff Land’s properly designed, heavy-duty tie-downs (optional). Working load – 800 lbs. 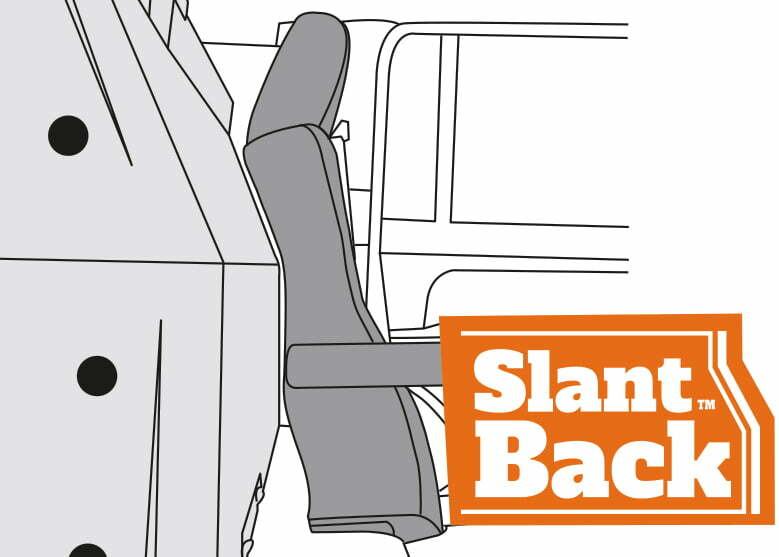 Select Ruff Land kennels feature a SlantBack™ design, an angled back end that fits perfectly up against the canted second seat on most SUVs. The door system on Ruff Land kennels can be configured to your liking with doors on both ends or on one end and either side. 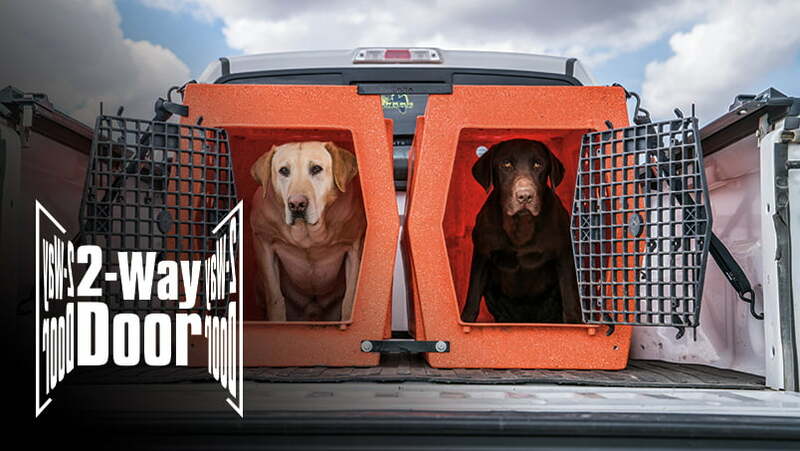 Our handy side doors allow you to put the kennel lengthwise on a back seat and still give you an available access door without having to remove the kennel from your truck, SUV or car. They are constructed of an ultra-tough glass-filled composite. They’re ambidextrous and can swing either way. 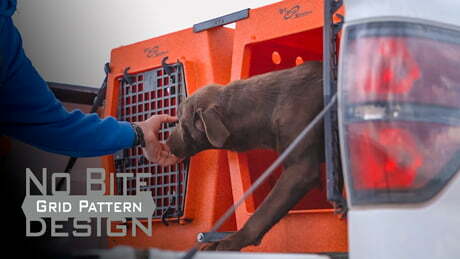 They feature a no-bite grid pattern that precludes dogs from chewing. They will not rattle (if you’ve owned other kennels you know just how annoying this can be). 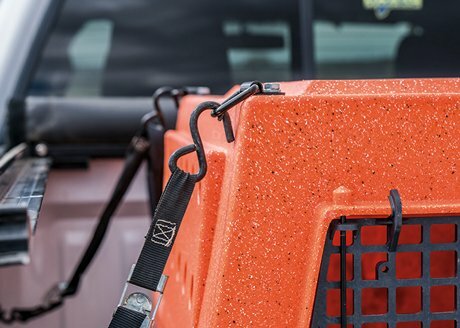 They feature an easy-to-operate latch with a durable, secure latch cover (unlike other kennels where the latch cover can fall off causing the latch mechanism to fall apart). Which door configuration works for you?